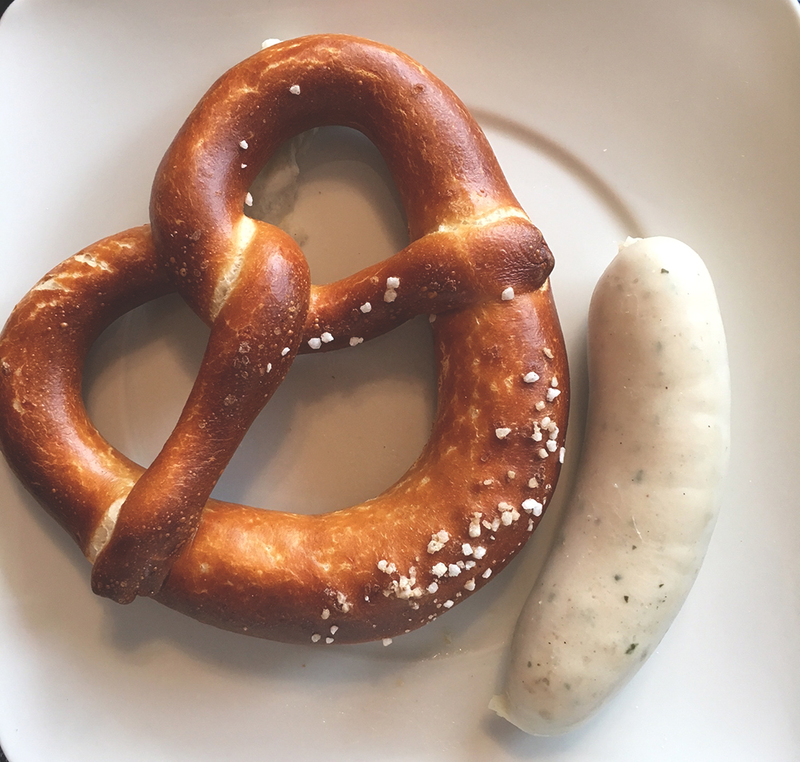 I have been meaning to write this post for a while now, it is something I love here in Bavaria, and a must try for everyone around the region. When With Locals invited me to try the traditional Bavarian breakfast with a local here in Munich, I thought it was finally time to get the post out there. 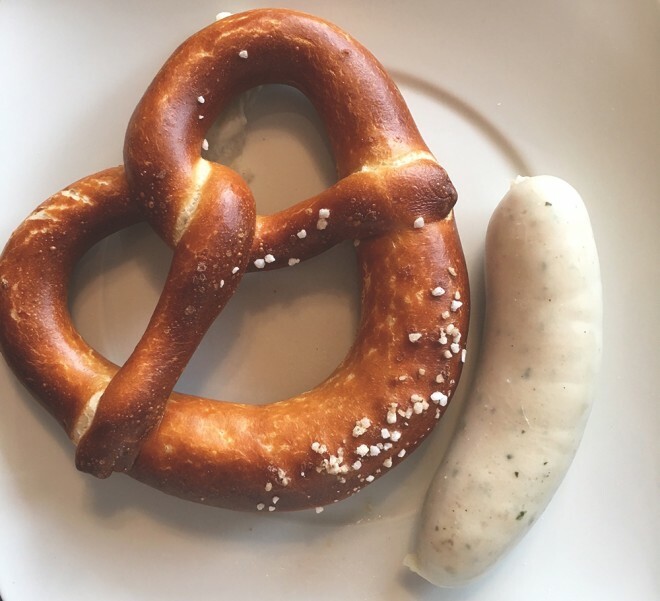 First of, if you tell a Bavarian that you just had the traditional Bavarian breakfast he probably won’t understand what you are talking about. That’s because they don’t call it that way. 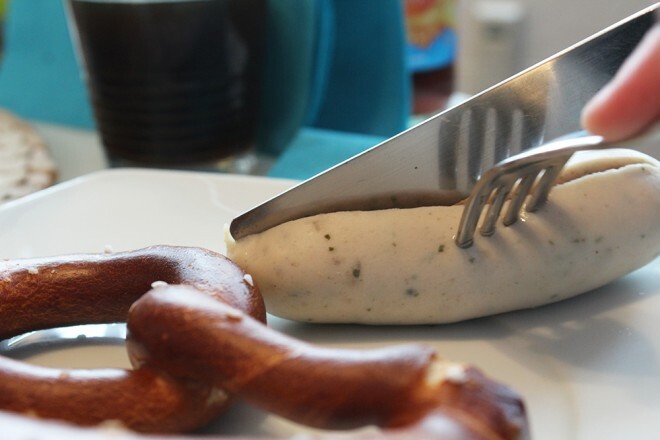 Though, if you mention Weißwurst Frühstück, they will know right away. 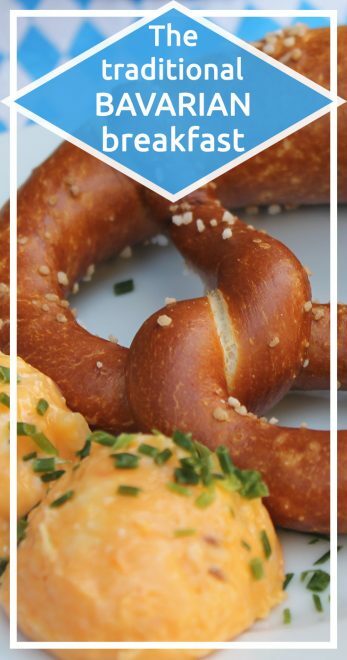 Also, it is important to know that you can find this breakfast in any typical Bavarian restaurant, at the Oktoberfest tents, and now with With Locals. Though, know that it is normally served only until 11:00 am or 12:00 am. 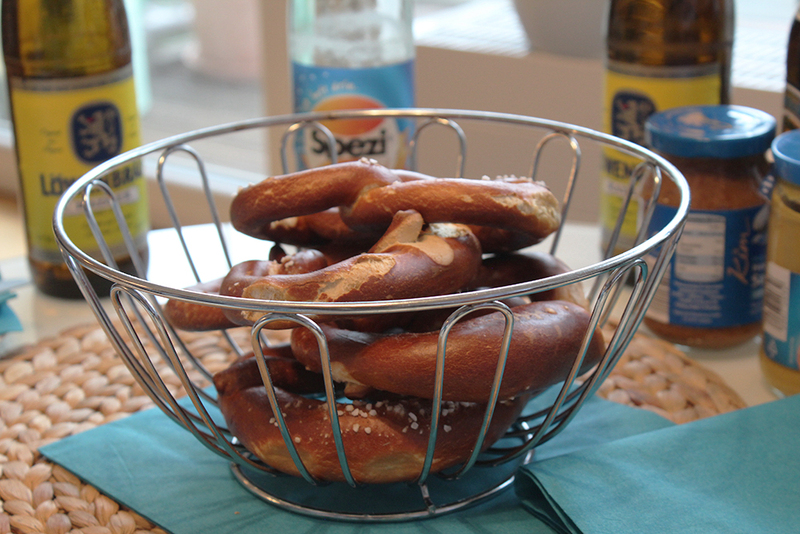 Popular in Bavaria as much as baguette is in France, this salty bread is present in almost every meal around here. 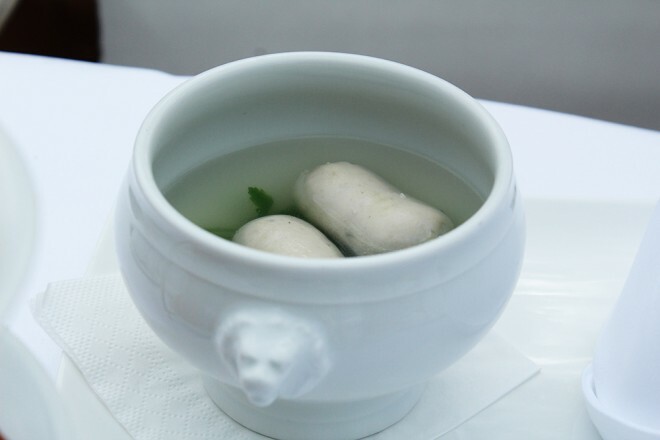 Literally white sausage, the star of the Bavarian breakfast. Created in Munich in 1857, more precisely at Marienplatz. They come in pairs, like church bells, one piece attached to the other, and are only eaten for breakfast. Why? They are very perishable and because back when they were created there was no refrigerator to keep them cool, they were made and eaten before noon before they were ruined. They are made from minced veal and pork back bacon, normally flavored with parsley, lemon, mace, onions, ginger and cardamom. 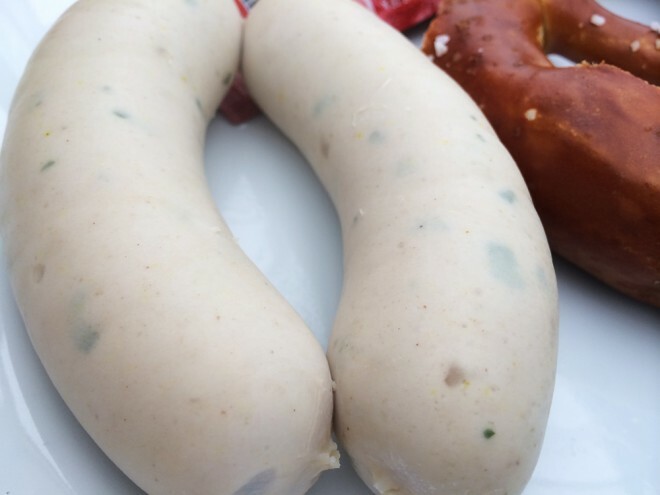 Some might not like the taste, but it’s the 3rd most popular sausage in Germany. Mustard and sweet mustard. 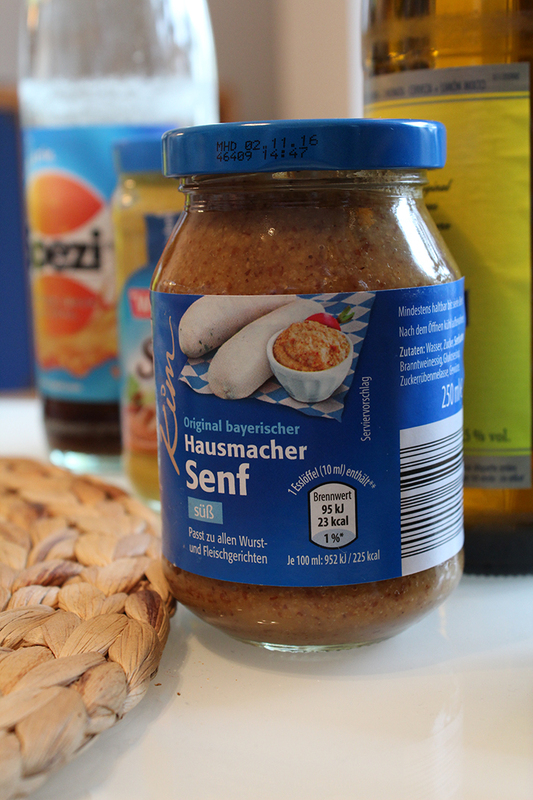 The tradition is to eat Weißwurst with mustard, preferably the sweet one – the most famous brand is Händlmaier, original from Regensburg. 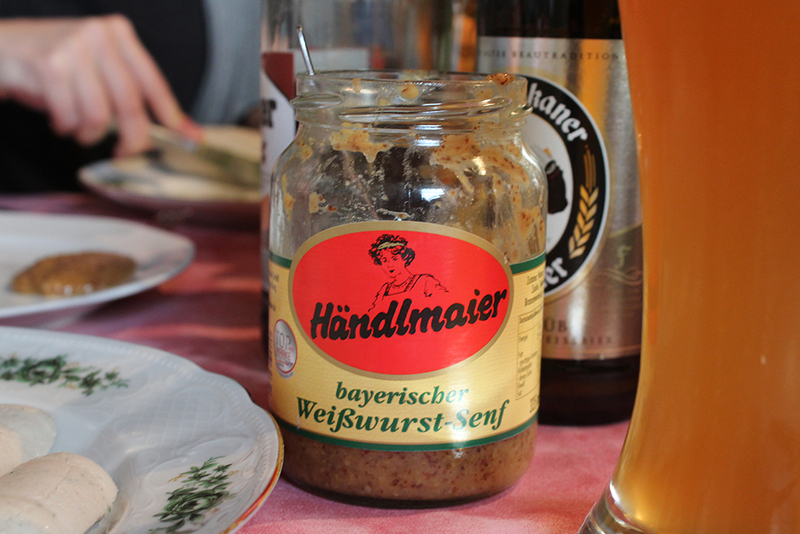 I don’t really like mustard, so I never eat it, I also know many Bavarians who don’t like it. However, the vast majority love it. To finish it up, beer, of course. The right beer to have with the Bavarian breakfast is the Weißbier, or wheat beer. 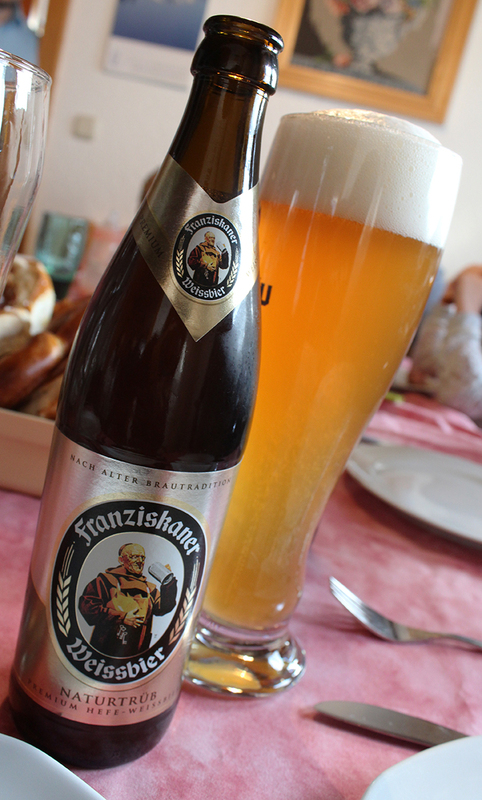 Yes, Bavarians have beer for breakfast. 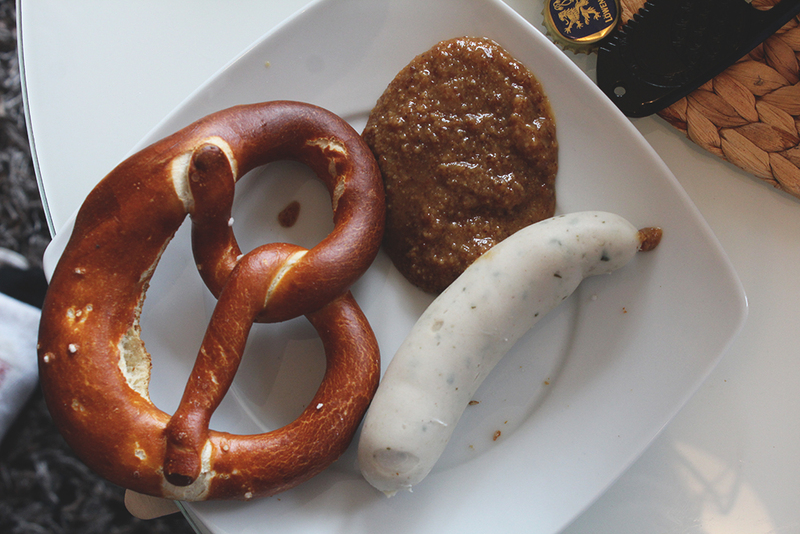 No, it’s not everyday, only with Weißwurst, and many people prefer other types of beer. With Locals put in practice the concept of connecting travelers and locals in a very awesome way. You can have a meal, take a tour or do activities with the locals of a certain place. They are present in 14 countries so far, and just started out here in Germany. For those of you wanting to take in as much local culture as possible, this is an experience you should give a try. What’s best than experience the local food with locals? You get to meet someone, make friends, learn more about the dish, how it’s traditionally prepared and eaten, and can even get some insider tips. I never pass the chance of meeting locals and learning from them, so I fell in love with With Locals concept and will definitely try in other countries. 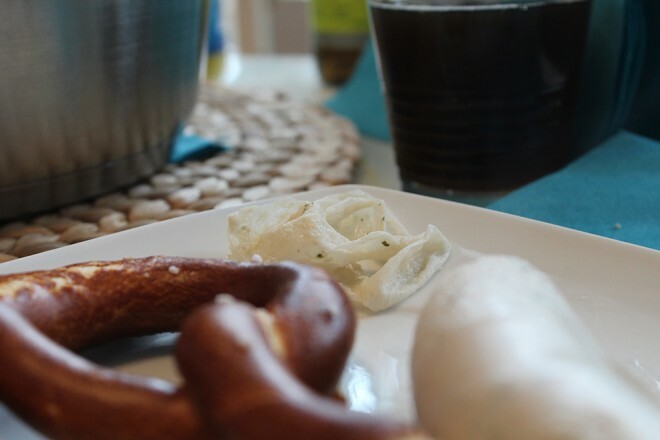 Of course, I live in Munich and have had many Bavarian breakfasts since I moved here. 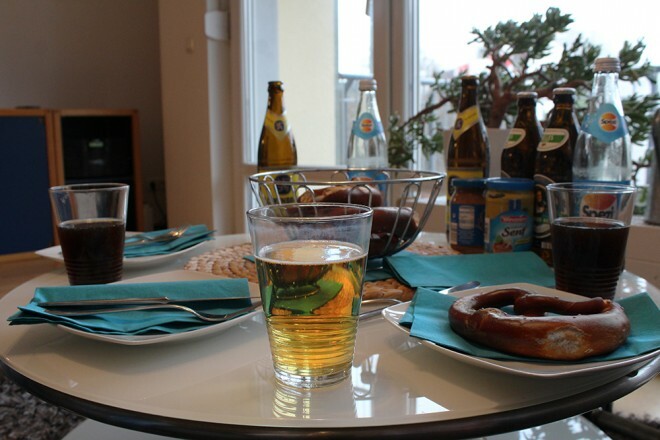 However, the experience of having a Bavarian breakfast with someone I don’t know, was new to me, and a great experience. I also got to prove that his breakfast is actually authentic and can highly recommend it. W and I went to our host’s house, Sven, around 9:30 in a Monday morning. He is a very friendly guy, who also speaks English and traveled a lot around the world. When we arrived, the Brezen were already on the table, as well as the beer. Since not everyone likes Weißbier, he had Radler – beer with lemonade, which I love – Helles and soft drinks. While he finished preparing the sausages, we discussed about this idea of eating with locals, about the places we have visited and our lives. Sven was kind to make both Weißwurst and Wiener, as he told us some people don’t really like Weißwurst. Well, that’s not our case, so we only had the traditional one. 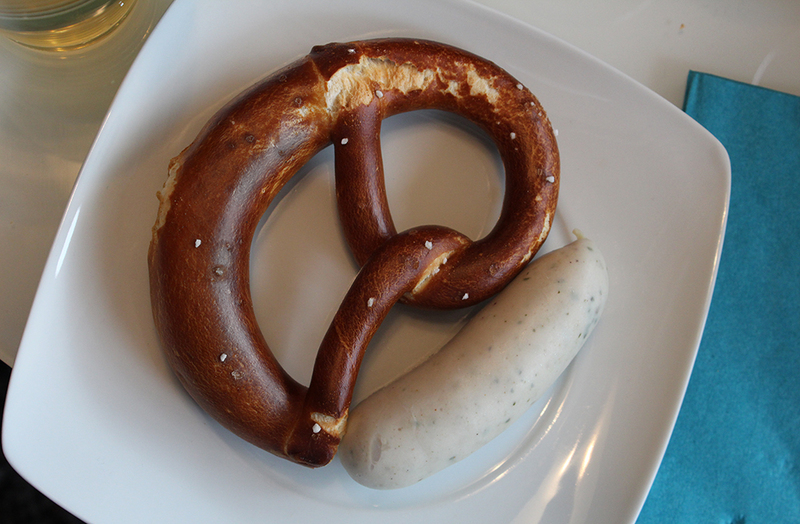 The Weißwurst was amazing; great quality – they are not all the same. Of course, he also had mustard – only for him to eat, as neither W and I like it. I had beer, the guys had Spetzi, a very popular drink in Bavaria too, which is basically Coke with a hint of orange. We had a great time! The booking can be made on With Locals website. For now they are available in 14 countries, you can choose the location, browse the activities for each, pick one and book. You can create a profile and keep in touch with the host before and after the experience. You can also become a host and share a little bit of your culture with others. Why not? Special thanks to With Locals team for inviting W and myself for a Traditional Bavarian Breakfast in Munich, and to Sven for hosting us. As always, all views and opinions are my own, and I only recommend what I like and believe my readers will like too. This is something very interest, not just the food but the concept behind breaking the fast. 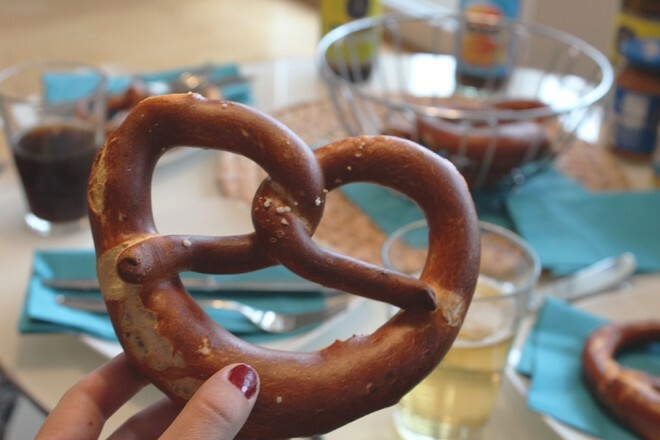 The idea of sharing the local culture while enjoying the food, the drink and the history behind the rich Bavarian breakfast and rich Cultural history. The way sausages are made and the way it is cut and eaten before lunch as there was no refrigerators then to keep it long, yes time has changed but certain things remain anchored to the history and the practice, not questioning the assumptions makes us relish and relate to the history and practice of eating, drinking and talking. Loved the beautiful descriptions and depiction of interesting facets of food and culture…indeed the experience with locals are always fascinating to hear and lovely to engage. By the way hope you had a lovely Christmas and wishing a wonderful week ahead of the New Year…Take Care!!! I hope you had a lovely Christmas too!! Yes with time and with web, past is becoming history than we had imagined and real things are sidelined when we are in the virtual world. Local culture and relics, history, heritage has so much to offer us and we have so much learn and be a part of that side of the world…things are changing and changing so rapidly that we don’t have time and space fathom and figure out what to do and how balance this two opposite side of the world. Wishing you a wonderful New Year and lots of fun and joy 2016…Cheers!!! Thank you so much dear Nihar! Can’t believe you didnt make me eat that for breakfast in Munich! I only found out what a must that was after I left Germany!!! hahaha one more reason to come back 😀 come come!